Bend it Like Beckham Kenyan born, British director Gurinder Chadha’s handsome post-colonial film Viceroy’s House about the partitioning of the Indian subcontinent in August 1947 effortlessly blends documentary footage of the historic event with gorgeous production design and exquisite costumes. Fresh from his success as playing Robert Crawley, Earl of Grantham in the hit BBC series Downton Abbey, Hugh Bonneville turns in a nuanced performance as Lord Louis Mountbatten the last Viceroy of India who has daunting task of giving India its independence after 300 years of British rule. Lord Louis Mountbatten is accompanied by his affected yet compassionate wife Lady Edwina Mountbatten played by Gillian Anderson (Shadow Dancer, The Last King of Scotland). Lily Travers (Kingsman: Secret Service, Me Before You) plays their daughter Lady Pamela Hicks. The actual task of dividing the subcontinent into India and Pakistan so brilliantly written about in Salman Rushdie’s seminal post-colonial text Midnight’s Children is taken up by Sir Cyril Radcliffe in Viceroy’s House superbly played by Simon Callow the stalwart supporting actor of all those Merchant Ivory film’s in the 1980’s and 90’s from A Room with a View to Howard’s End and Jefferson in Paris. Sir Radcliffe after admitting that he has never stepped foot in the Punjab admits that this is “a monstrous responsibility for one man”. Equally on edge at the thought of a massive subcontinent being divided and suddenly changing power, are the two love interests of Viceroy’s House, the Hindu manservant Jeet wonderfully played by Manish Dayal (The Hundred-Foot Journey) and his Muslim girlfriend Aalia played by Huma Qureshi. Aalia, a bright and intelligent woman has to look after her father Ali Rahim Noor played by the recently deceased veteran Indian actor Om Puri (The Hundred-Foot Journey, Gandhi). Michael Gambon who was so brilliant in Brideshead Revisited makes a welcome addition to the British cast as General Lionel Hastings who proves to be more deviant and manipulative as the partition date approaches in the summer of 1947. In terms of setting the right political tone for the Viceroy’s House director Gurinder Chadha relies heavily on actual news and documentary footage of the partition and the massive disruption and refugee crisis it created when the subcontinent broke into India and Pakistan and then again into Bangladesh. Chadha chooses to use the actual historical Viceroy’s house a sumptuous Empire palace to metaphorically show a subcontinent being torn into two as all the house servants had to literally choose which country to belong to in the space of three weeks: India or Pakistan, as well as callously divide up all the possessions of this magnificent estate. 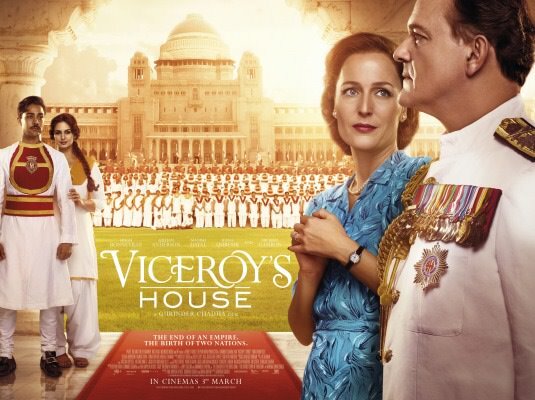 From a historical perspective, Viceroy’s House is a fascinating film about the after effects of colonialism and the subsequent first heady days of independence in this case not of one country but two divided controversially along religious lines, Hindu and Muslim. Audiences that enjoyed Midnight’s Children, Heat and Dust, A Passage to India, will certainly enjoy Viceroy’s House although these films are a far cry from the contemporary portrayal of India and Pakistan in such films as Danny Boyle’s Slumdog Millionaire and Mira Nair’s The Reluctant Fundamentalist. 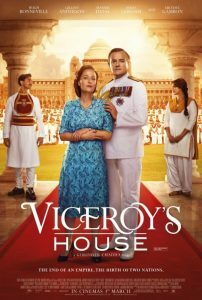 Fascinating, tragic and historically relevant, Viceroy’s House with its sumptuous production design and beautiful costumes gets a film rating of 8 out of 10.